The new lighter Audi A3 has arrived and it's packing some serious tech credentials. The first models from the new line up - the Audi A3 SE, A3 Sport and A3 S line - will be available to order from the 15 September 2012 and the Germans are quite clear about where they want their latest offering sitting - in the driveways of the tech-savvy. Speaking to T3 at the UK launch of the new Audi A3, Jon Zammett, Head of PR said: "The new range is designed to appeal to computer orientated consumer. We wanted to make being in this car an easy leap for someone who's working on a tablet day in day out." The latest upgrade to the premium compact range, the new A3 comes loaded with gadgets previously only seen on the larger Audi models such as the S6 and S7. A new 11mm-thin slimline 5.8” QVGA slideaway colour display acts as the focal point for the built-in sat nav, media smarts and phonebook, all of which are controlled via an as-standard Multimedia Interface (MMI). For the first time, Audi's MMI Touchpad controls - with handwriting recognition that lets you use your fingers to write and search phone contacts and sat nav destinations - are optional. In previous ranges the touchpad has been seperate but this has been cleverly built into the main control wheel in the cenrtal control unit, saving space. Full Bluetooth connectivity lets you hook up your smartphone for hands free mobile phone calls and streaming audio to the car's eight passive speakers which are capable of kicking out 80 watts of sound. For those looking for a bit more punch, there's the option to upgrade the speaker system to a 14-speaker 705-watt Bang & Olufsen set up with 5.1 surround sound. Line-in connections are also included in the central arm rest with the option to tether a wide range of Apple, Android and other media devices although you'll need to buy any extra cables seperately. There's a CD/DVD player tucked neatly away inside the glove compartment alongside two SD cards slots that enable sat nav map updates and the loading of media and phone contacts on to the cars built-in 20Gb hard drive. 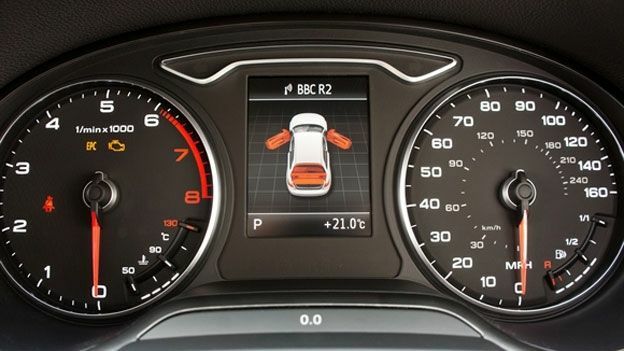 The SIM card based Audi Connect fucntionality that turns the car into a Wi-Fi hotspot, opening up services such as Google Street View, Internet radio and live traffic information will be available later in 2013. The new Audi A3 starts from £19,205 on the road. The A3 1.4 TFSI, A3 1.8 TFSI, and A3 2.0 TDI will be available from 15 Sep while the A3 1.6 TDI will arrive at the end of 2012.